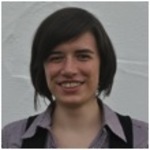 Melanie Hudler is an undergraduate at the University of Vienna, Austria with a degree in Transcultural Communication. She studied Romanian Language and Culture at the University of Bucharest as an Erasmus student for one semester. Since October 2011, she has been an M.A. candidate in Literary Studies (German and English) and History at the University of Bayreuth, Germany, where she focuses on intercultural communication, anti-discrimination activities, critical whiteness, and gender studies. She writes critical articles for the weekly campus newspaper concentrating on socio-political topics and is active in the university group of the German Social Democratic Party youth organisation, especially in the area of informing about right-wing extremism in Germany. Melanie has been involved in several different social projects in Romania, Austria, and Germany. After school, she has worked as a volunteer in orphanages in Braşov/Romania. During her time in Vienna, she has worked with asylum applicants and taught German language courses. She is currently doing a traineeship at a local newspaper in her hometown.